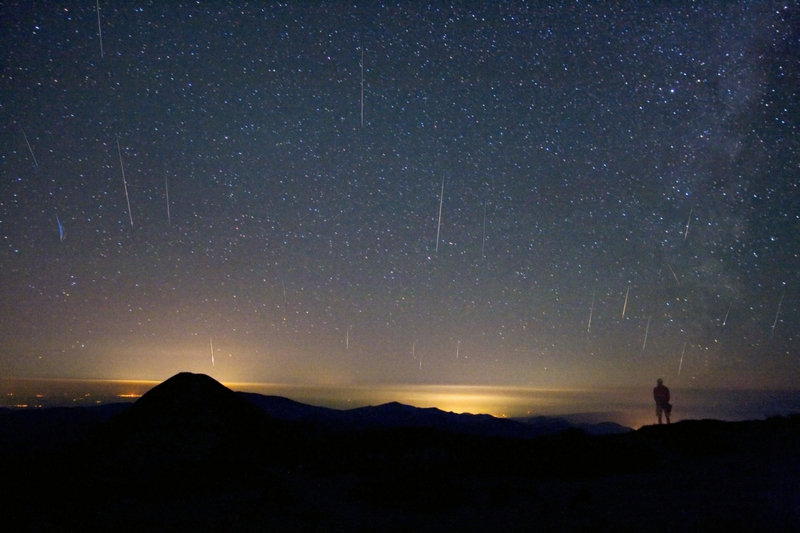 Explanation: A mountain top above the clouds and light-polluted cities was a good place to go to watch this August's Perseid meteor shower. In fact, this composite picture from one of the highest points in Romania, the Omu summit (2,507 meters) in the Southern Carpathian Mountains, captures about 20 of the shower's bright streaks against a starry night sky. The cosmic debris stream that creates the shower is composed of dust particles moving along parallel paths, following the orbit of their parent comet Swift-Tuttle. Looking toward the shower's radiant point in the constellation Perseus, perspective causes the parallel meteor streaks to appear to diverge. But looking directly away from the radiant point, as in this view, perspective actually makes the Perseid meteors seem to be converging toward a point below the horizon.